Multi-unit buildings require the use of fire-rated foam. Adfast, concerned about occupant protection, is proud to announce the release of its new Adfoam Fireblock foam. Able to delay the spread of flames for up to 4 hours, Adfoam Fireblock is the perfect foam to provide extra time to evacuate safely in a fire. Not only does Adfoam Fireblock protect against fire but it also protects against smoke and gases. Adfoam Fireblock contains only 2 g/L of V.O.C. (volatile organic compound) which significantly reduces the ecological footprint. All our insulating foams are also CFC (chlorofluorocarbon) free. 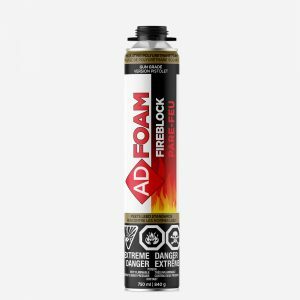 Adfoam Fireblock offers a yield of 55 liters per can of 840 grams. Where to apply Adfoam Fireblock? Adfoam Fireblock can be applied around pipes, cables or other components passing through walls, floors or ceilings. Adfoam Fireblock also serves as thermal insulation for roofing or adhesive applications in some cases. Adfoam Fireblock can be used in window and door manufacturing, transportation, HVAC, building materials, prefabricated houses, machinery, agricultural machinery or any other market where a product offering resistance to fire is required. On which materials can Adfoam Fireblock be applied? Adfoam Fireblock adheres to a variety of materials including aluminum, steel, wood, some plastics and masonry products. If you want to be sure Adfoam Fireblock will adhere to the material you want to use, please contact your technical representative who can do an adhesion test for you.